East Hampton Town Board members at a meeting in Montauk last summer. The East Hampton Town Board is expecting to hear public comment this fall on two local laws designed to make it easier to develop affordable housing. The first proposal is a code change that would allow people to rent affordable apartments in accessory structures on their properties, provided they adhere to several new rules and their tenants meet affordable housing guidelines. East Hampton has allowed affordable accessory apartments within homes since 1984, but few people have applied for permits for those apartments. Up until now, the town has always prohibited the use of accessory buildings as living space. A public hearing is expected tonight to be scheduled for the board’s Sept. 1 meeting at 6:30 p.m. If the proposal is adopted, properties eligible for the apartments would have to be at least 20,000 square feet (a shy half-acre), and the total number of cars kept overnight on the lot, between the tenant and the property owner, would be limited to four. The apartments would be allowed with an administrative permit in residential zones, but would be subject to site plan review in residential properties in commercial zones. The most recent draft of the law also allows homeowners to build new accessory structures to accommodate the apartments — earlier drafts required the rental space to be existing prior to the law being enacted. New construction would need to meet the setback requirements of the principal dwelling and the buildings would need to be at least 600 square feet. The apartments would have to be rented at no more than 110 percent of HUD’s Fair Market Rent in Nassau/Suffolk, and the tenants would not be able to earn more than 130 percent of the Nassau/Suffolk median family income for a family of their size. They would not be allowed to be sublet. Property owners would also have the option to live in the accessory apartment themselves, so long as they do so year-round, and rent out their principal dwelling to a year-round resident family that meets the affordable housing guidelines. The town is also considering changes to the code to allow an affordable housing overlay district over a limited business overlay district — a change that would primarily affect some properties along Montauk Highway, including the controversial 555 Montauk Highway property in Amagansett, and on North Main Street in East Hampton. 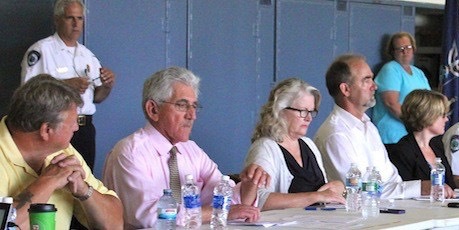 East Hampton Town Attorney John Jilnicki said at a work session Aug. 2 that, currently, properties in an affordable housing overlay district can only have one use. Properties in a limited business overlay district can have both businesses and second story affordable apartments above the businesses, and still be considered just one use. But the code is silent on properties that are in both overlay districts. Town Assistant Planning Director JoAnne Pahwul said at the work session that the limited business overlay district only affects the first 150 feet in from the street frontage of properties. “This just clarifies it for properties with the affordable housing overlay as well,” said Councilwoman Sylvia Overby. The board has not yet set a date for a public hearing on this proposal.